For 2016 recruit Kieffer Bellows, his first USHL season ends with a Clark Cup championship. 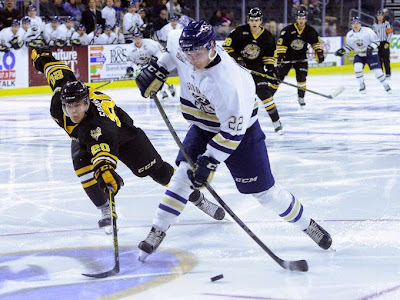 The power forward from Edina, Minn., scored the game-winning goal (short-handed & unassisted) as Sioux Falls beat Muskegon, 4-2, to sweep the best-of-five series. Bellows scored 9 goals in 12 playoff games, including six goals in the last four games and the game-winner in two of the Stampede’s series-clinching games. During the regular season, he scored 33 goals, most ever for a 16 year old since the USHL became a Tier 1 league. After a slow start with four goals in 19 games, the league’s hottest goal-scorer rang up 29 in the next 39 regular season games. The Stampede’s youngest player, he finished two behind league co-leader and 2015 BU recruit Robert Carpenter, who had 35. ►At the IIHF World Championships, Team USA—featuring Jack Eichel and ex-Terriers Nick Bonino and Charlie Coyle—plays in the Bronze Medal game today against Czech Republic, the tournament host. In yesterday’s semifinal, Russia broke open a scoreless game with four goals to eliminate the US from championship contention. ►Three current Terriers and two recruits will skate together in the 2015 John Cunniff Senior Chowder Cup in July. The roster for the Esquires Elite team includes rising sophomores AJ Greer, JJ Piccinich, Brien DIffley and Brandon Fortunato, along with 2015 recruit Charlie McAvoy and 2016 recruit Clayton Keller. The tournament runs from July 16-19 with games in Walpole and Bridgewater, Mass. Last month, McAvoy and Keller, along with 2015 recruit Jordan Greenway helped the NTDP U18s win the World U18 Championship. ►Chris Heisenberg’s recruiting Web site indicates the sophomore Kevin Duane is transferring to Quinnipiac. After scoring 10 points (6G, 4A) in 33 games as a freshman, Duane was scoreless in four games this past season. ►2017 recruit Patrick Harper participated in the recent New England Pro-Am Pre-draft Showcase. SB Nation reviewed his performance. Patrick Harper, LW, 5-8/155, Avon Old Farms (NE Nordiques Blue) - He's had better performances, but he was going up against largely older players by two to three years this weekend. He still showed off his dynamic offensive abilities. He cuts well, uses his edges and has incredible hands. His lateral mobility is very good. College: Boston University. Harper had a strong sophomore season at Avon Old Farms with a 20-27-47 line in 22 games for the Winged Beavers. He had committed to BU last September.